Can we all please stop saying Filipino food is a trend? 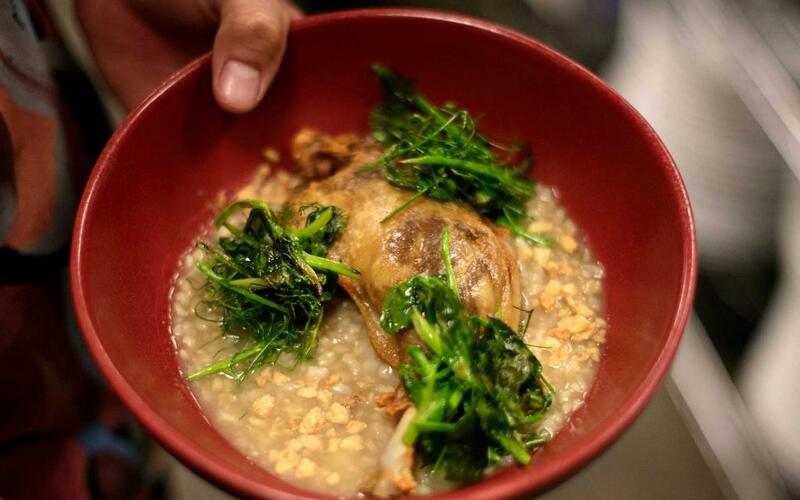 Filipino food has earned a permanent spot among all the other popular cuisines in L.A. Instead of calling it trendy, let’s call it what it really is: damn good food. Filipino cuisine is all about bold, unforgettable flavors with heavy Spanish, Malay, and Chinese influence. The salty, sour, and sweet flavor profiles are exciting enough to wake a dead man’s palate. If you haven’t yet fallen in love with Filipino food, these dishes will have you weak in the knees. The chefs at Neri’s have been doing beautiful and flavorful things to pigs for more than 30 years. Juicy slabs of pork belly with extra crunchy skin—it’s the best thing to happen to pork since bacon. The portions at EagleRock. Kitchen are big enough to share, but these adobo-style beef ribs are so fall-off-the-bone tender, you might want them all to yourself. Naked fried chicken is seeing a resurgence right now, but Filipinos have been doing it this way since, like, forever. Filipino fried chicken is made with a light rub of seasoning and flour without any of that unnecessary breading. 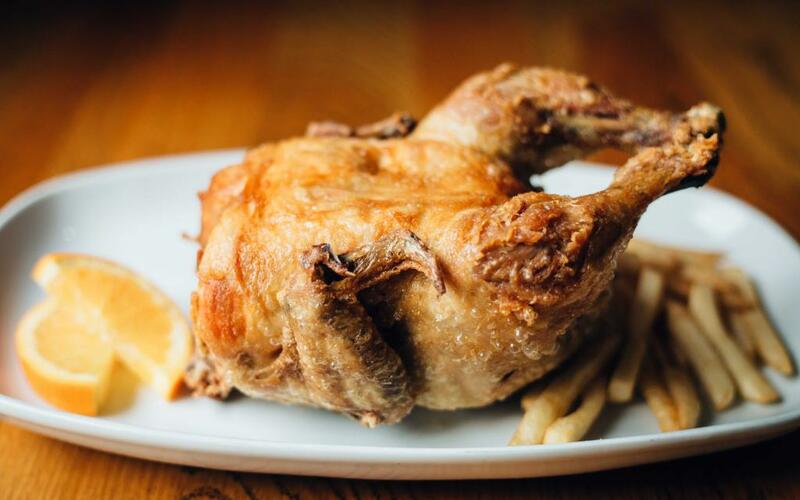 Max’s specialty is their Pinoy-style fried whole chicken. The skin is light, crispy, and crackle-y, and the inside stays juicy. Bonus points for dipping it in the banana ketchup. 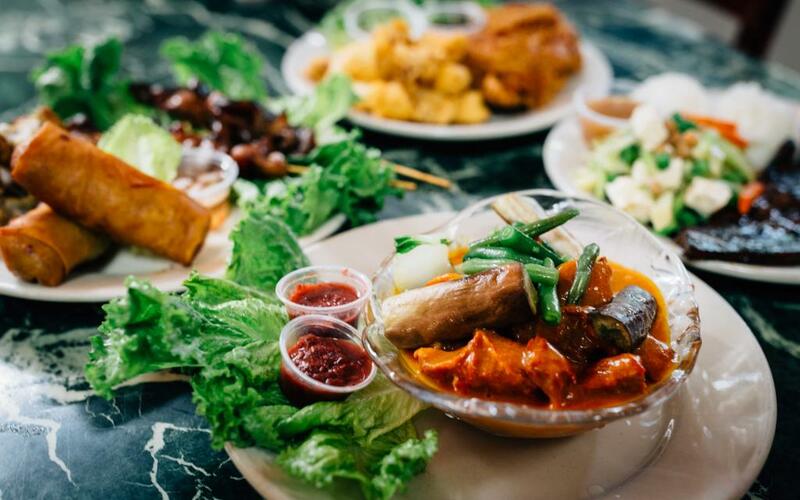 Travel down Temple Street and you will find yourself in Historic Filipinotown, a small enclave of Echo Park. Make your way over to Bahay Kubo. 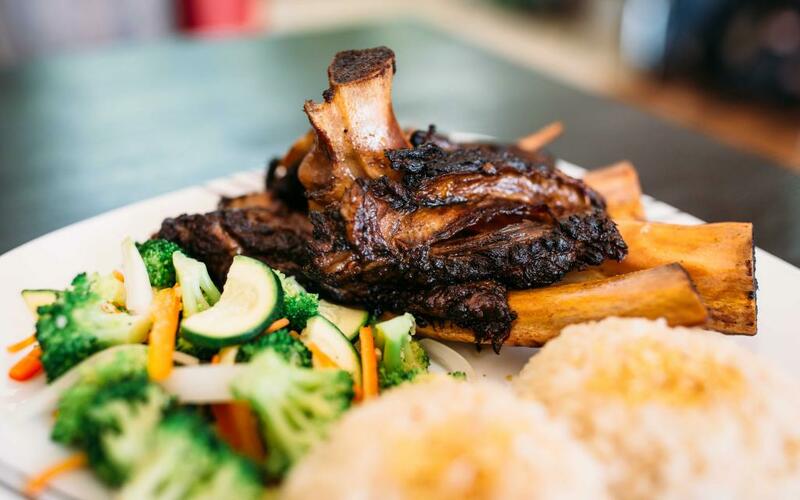 It’s turo turo or traditional Filipino cafeteria-style fast food, so you can try a little bit of everything. Grab a seat facing the TV so you can watch some game shows on the Filipino channel that involve singing and dancing. On the northwest corner of La Cienega and Venice sits the L.A.rsian BBQ truck. They specialize in Filipino meaty goodness, and somehow they’re able to achieve the perfect amount of char from a small grill in the back of a truck. Feast on a plate of $1 skewers. Because who doesn’t love meat on a stick? Bring a friend to help you tackle this mouthwatering pork dish. It’s a crispy fried pork knuckle, and it’s the size of your face. LASA serves up California-influenced Filipino food in a modern setting. They may be known for their pancit, but don’t sleep on their arroz caldo (Filipino rice porridge). It’s served with crispy duck and garlic chips, giving it a range of textures and flavors that is most satisfying. Halo halo (which means “mix mix” in Tagalog) is the Filipino version of shaved ice. It’s the most celebrated Filipino dessert. 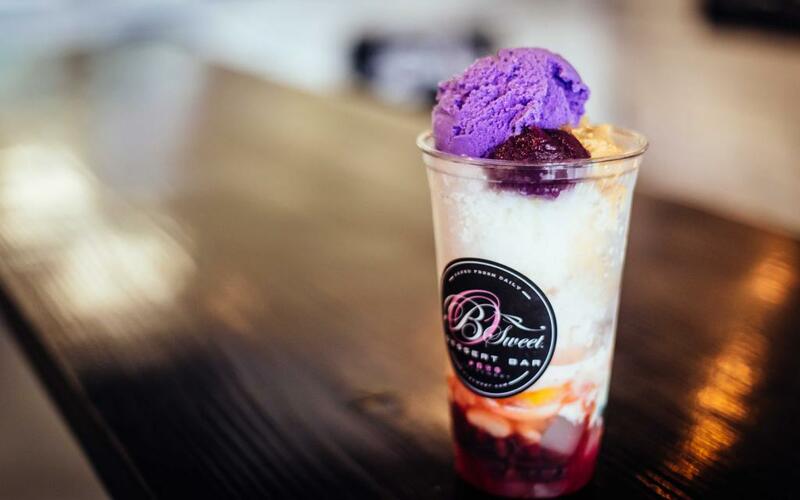 B Sweet has some of the best halo halo in town. They also have a variety of ube (purple yam) desserts and sweet treats that’ll satisfy your Pinoy-inspired sweet tooth. There’s now a reason to celebrate if you’ve been summoned for jury duty. Pili Manila Grill is a short walk away from the courthouse and is located in the food court of the Los Angeles Mall. 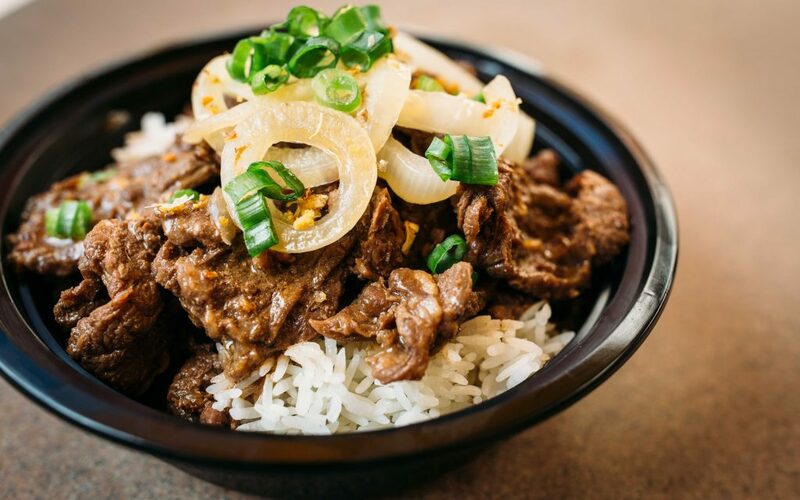 Pili Manila Grill is the highlight of this entire mall, and there probably isn’t any other reason to go to this mall other than to get a bistek (Filipino beefsteak) rice bowl from Pili Manila. You can’t really go wrong with American BBQ and Filipino food. 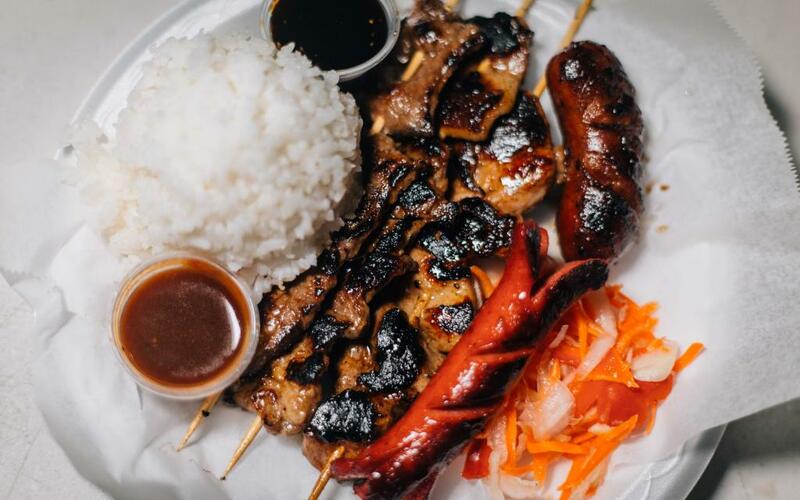 If the two cuisines had a love child, it would be Park’s Finest BBQ, which marries traditional BBQ with Filipino food (with Mexican and Salvadorian influences too). 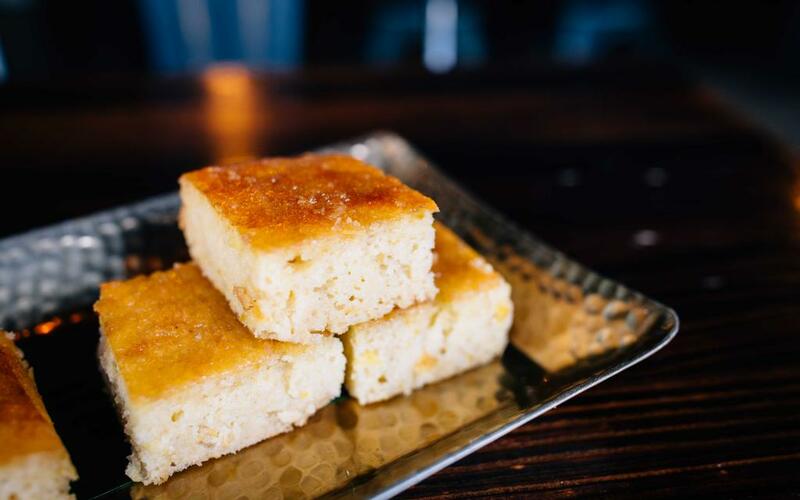 Before stuffing your face with some of L.A.’s best BBQ, try the cornbread bibingka. Bibingka is Filipino rice cake made with coconut. When it’s mixed with cornbread you get a little slice of heaven. 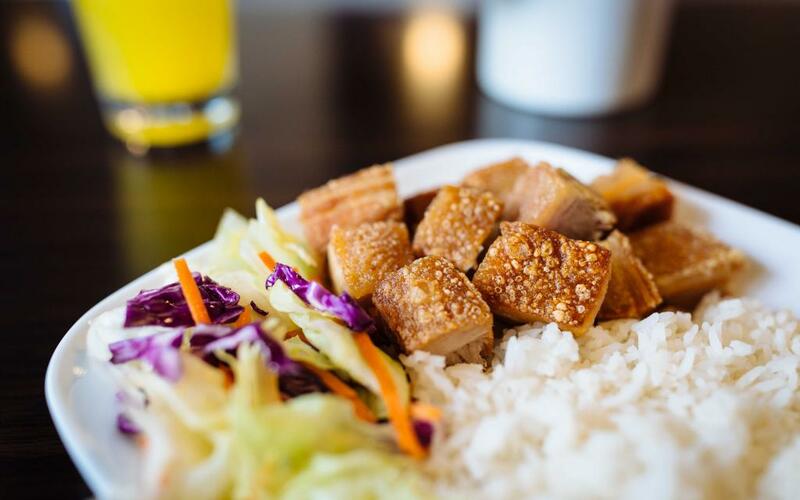 RiceBar had the food world abuzz in 2015, which helped create the surge of interest in Filipino food that has taken over L.A. How did a tiny little hole in the wall help introduce Filipino food to the general population? By seducing us with delicious rice bowls, that’s how. Their longganisa rice bowl is a crowd pleaser. 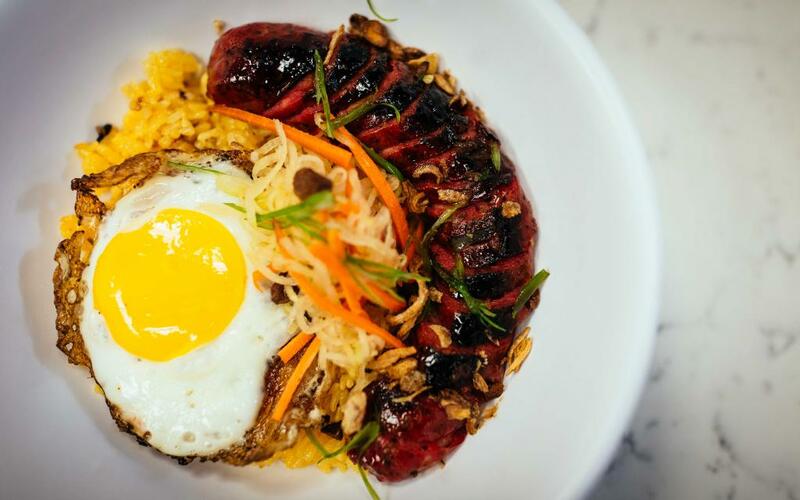 This tasty Filipino sausage is served with a crispy, yolk-y fried egg. If you have a peanut allergy, do not come near this dish. But if you don’t, you’re going to want to jump in headfirst and bathe in a big bowl of Barrio Fiesta’s kare kare. Their version of the savory peanut stew has chunks of oxtail, beef, and tripe. Instead of going to some overrated brunch spot this weekend, head over to L.A. Rose Café for a Filipino style breakfast. 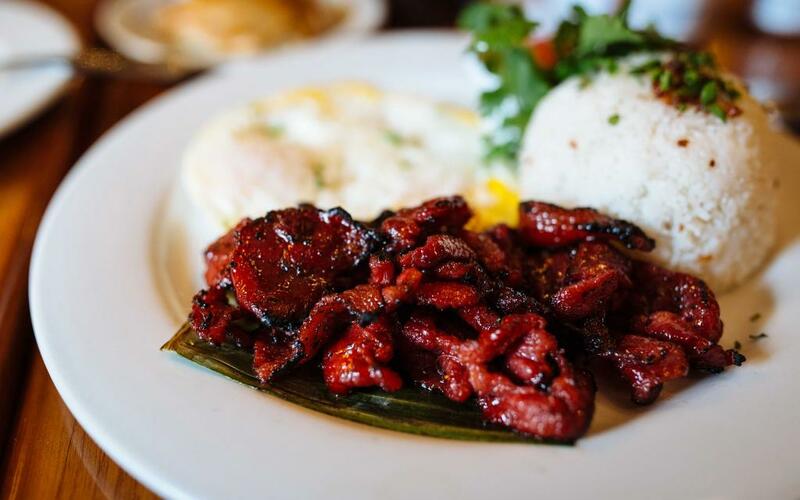 Tocino is a typical Filipino breakfast meat similar to thick-cut bacon or ham. It’s a little sweet, a little savory, and a lot of mmm! This cute café in Silverlake is a coffee shop collaboration between Crème Caramel in Sherman Oaks and Found Coffee in Eagle Rock. You’ll find a variety of crème caramel, otherwise known as “leche flan” to Filipinos. 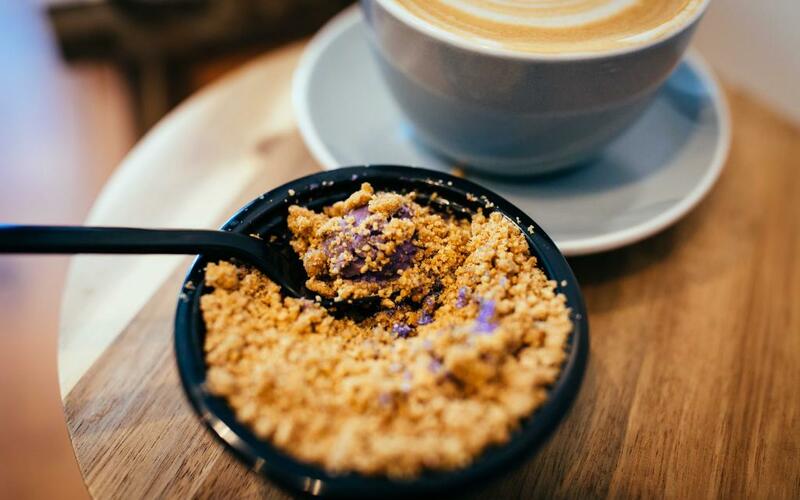 For the ultimate ube experience, get the ube crème caramel with graham cracker topping. And if you need a caffeine fix, try the ube horchata latte. Sisig originated as a way to make use of pig head, and Gerry’s Grill in Cerritos does a classic rendition by crisping up little pieces of chopped up pig head and skin in a sizzling hot plate. For an added yum factor, ask for an egg on top. 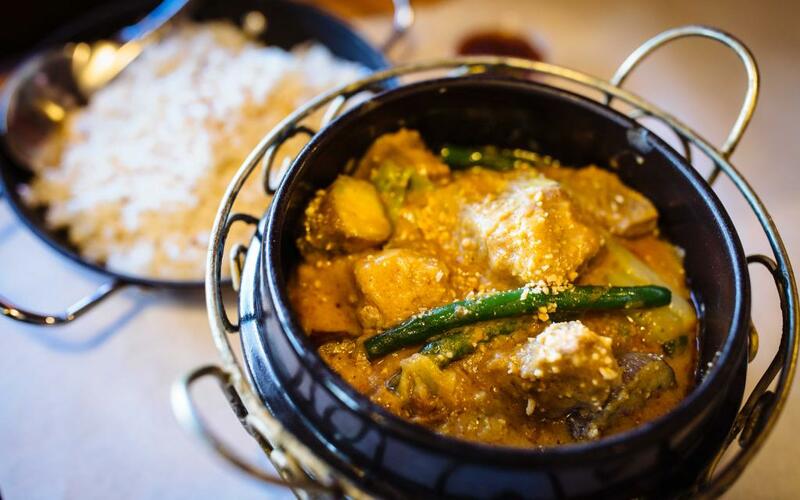 When the food’s ready, you’ll hear the dinner-call “Hoy! You eat now!” Follow You Eat Now’s Instagram and wait for their dinner call to tell you when and where they’ll be popping up again. 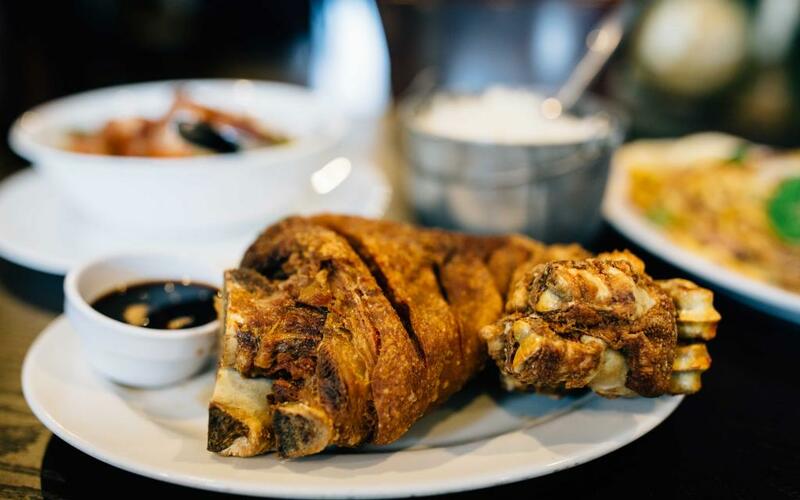 Their chicharon-encrusted lumpia is worth the wait.